Expro is committed to advancing technology in the field of drill stem testing (DST) and our investment is driven by the requirements of existing and emerging growth markets. With close links to our long established Subsea product line development group, a dedicated DST engineering team guided by seasoned professionals, work together in-house to develop and introduce innovative DST tools. 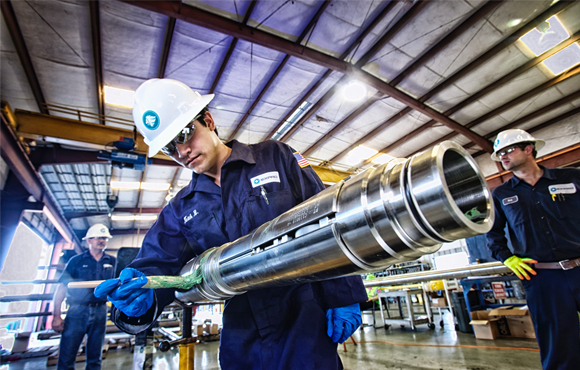 As the industry moves to harsher environments, including wells located in deep and ultra-deep waters to ultra and extreme-HPHT wells, Expro's focus is safely and reliably delivering increased functionality and efficiency, to enable the capture of accurate and valid data to meet specific well test objectives. Our new generation drill stem testing systems, featuring the EXAL tool system, are now available and delivering significant value to our clients across the world. The EXACT™ tool is an advanced multi-cycle, fully annulus pressure operated tool, which combines the functionality of a tester valve for down-hole shut-ins and a circulating valve for spotting cushions and treatment fluids, and reverse and forward circulating during well kill operations. Being annulus operated, it is ideal for gas well testing and when deployed, EXACT replaces the POTV and tubing-operated MRST in the DST tool string. EXACT features a high-strength debris-tolerant ball sealing system capable of supporting a 15,000 psi pressure differential from both above and below and can withstand high-differential opening. The unique smart-collet and interlocking system, which operates in conjunction with the indexing sleeve, makes this tool highly operationally flexible and efficient. It requires a maximum of four annulus pressure cycles to place the ball and circulating ports in any required position; the ball and ports are mechanically prevented from being open at the same time. In addition to the minimal number of required cycles, as the tool operates against a trapped reference pressure, there are no costly waiting times between cycles. Having a high-rate circulating capability (10 bbl/min) and being fully annulus operated, these features make EXACT the ideal choice for gas well testing and high cost operating environments such as deepwater. Expro's new generation flapper-type SF-TTV is an innovative departure from traditional designs. Its unique patented bi-directional tubing-to-tubing bypass means the flapper never leaves its seat, cannot wash out, is highly debris tolerant and unlike conventional flapper-type TTVs, forward circulation is possible. The main purpose of the valve is to allow the tubing string to fill from below for multiple/unlimited pressure tests whilst running in hole. After the final pressure test the valve requires to be locked out of service leaving an unobstructed bore. The tubing-to-tubing bypass design means the string is not compromised when pulling from a seal-bore packer and allows drain back of mud during heave conditions on floating vessels, thus promoting a safe operating environment when making connections and avoiding non-productive (rig) time (NPT). In HPHT applications an upper and lower SF-TTV can be deployed, with lower valve used to test the DST tool bottom hole assembly (BHA) and the upper valve isolating the BHA, including pressure-temperature gauges, from unnecessary multiple high pressure tests on the tubing string. The Expro BigCat™ packer is a high-strength, compression set, tubing-retrievable packer; expressly designed for the demands of drill stem testing operations and also serves as an efficient and viable alternative to permanent seal bore packers when testing HPHT wells. It is built to NACE MR-01-75 specifications and is capable of withstanding 12,500 psi differential pressure from above and below when set, at temperatures up to 400°F. Its unique slip and cone design, extensively tested with multiple loadings of 520,000 lbf, makes it one of the highest specified packers of its kind on the market. The hydraulic hold down sub, which can be fully pressure tested at surface, ensures that the packer remains set when subjected to excessive pressure from below during stimulation operations for example. An integral high-flow fluid bypass ensures efficient deployment. The packer requires only a small amount of right hand rotation to set (one-eighth of a turn at the tool) and releases to the safety position with straight pull. 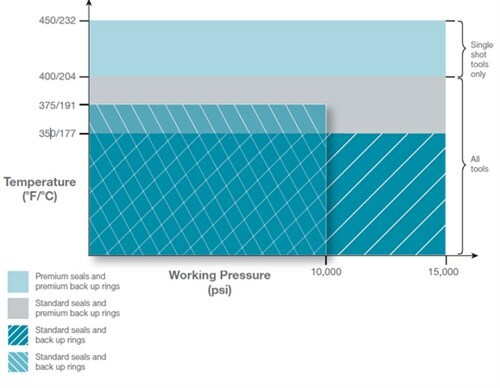 As the industry moves to ultra-high temperature downhole environments, Expro has introduced a premium sealing system to enable its DST tools to function in temperatures up to 450ºF (232ºC), whilst retaining their 15,000 psi differential pressure rating. The operating envelopes, depending on applied sealing systems, are given in the chart below.